The Inhumans pay the tribute. 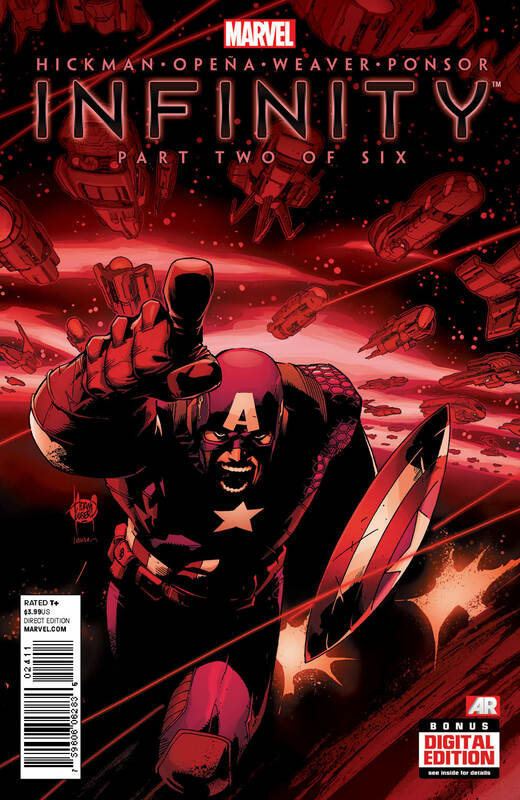 Cover– This month’s cover has a red hue bathing everything, war rages on around him but Captain America leaps head first into the fray. Interior art- Jerome Opena and Dustin Weaver are both on this issue but it does not detract at all. The facial and emotional portrayal of the characters are all spot on. Epic Scale- One thing that this event has going for it is it’s unification of the entire mainstream marvel universe. Stuff is happening on Earth on multiple fronts and on the other side of the galaxy again on multiple fronts. Inhumans– The illustration of the Inhumans as regal was spot on, though I still can’t tell how or why they left the Kree after the War of Kings event but I’m loving them right now! Respect- It’s a nice feeling to see Wakanda actually on the winning side nowadays after Doomwar and AVX. Illuminati– I really enjoyed Hickman’s use of his illuminati in critical roles throughout earths conflict with Thanos invading forces. Black Panther and Wakanda managed to repel the invaders; Dr. Strange fell to Ebony Maw while Iron Man and Reed Richards try to hold New York City. Black Bolt meanwhile and his Inhumans are given the same proposals as the race from the FCB day issue. Kill all your young between a certain ages. At the time the tribute was very vague but this issue sheds new light on earlier events involving Thanos and his “tribute”. Revelation- So Thanos has come to Earth to find and kill his son to appease lady death. This ties in to the continuity of the Thanos Rising storyline. Too big- Jumping all across the galaxy may be too much for some as the scope and constant jumping from point to point will def put some off. ← First look at Bronze Tiger in Arrow Season two! I don’t keep up with Marvel space but I’m a huge fan of Vulcan, the third summers brother. Does he show up in this series? Good blog post though. I’m definitely considering reading it. The artwork is fantastic! Especially on the different backdrops. It really takes you to other worlds.